Pale skin and sunscreen go together like peanut butter and jelly, like milk and cookies, like Maree and all cupcakes. I always have quite a few on hand for the summer because I always need one no matter where I go, especially the beach. In addition to sunscreen, I always have an after sun lotion and hydrating spray to help apply during and after our beach fun. Or as I call it 'sit under the umbrella wearing a big hat fun'. 1. MDSolarSciences Mineral Creme SPF 30 - To be honest, I had received this as a press sample a while ago and threw it in my beach bag not knowing what to expect. I have to say I was pleasantly surprised. It has a slight tint to it which was delightful since many sunscreens can have that white/purplish cast on the skin. I used this mostly on my face and chest and loved the way it absorbed right into my skin. 2. Dermalogica After Sun Repair - This is absolutely refreshing and necessary after a beach day. I typically put it in the refrigerator a few minutes before I am going to use, but this time I brought it with me to the beach to apply right after. I had a few patches of skin that got a bit red, so after I rinsed off at the showers, I layered this on those areas. It immediately soothes and begins to heal, and helps to prevent any peeling. It can feel a bit sticky so I only use a small amount and if not applying directly after the beach, then I apply before I go to bed. 3. 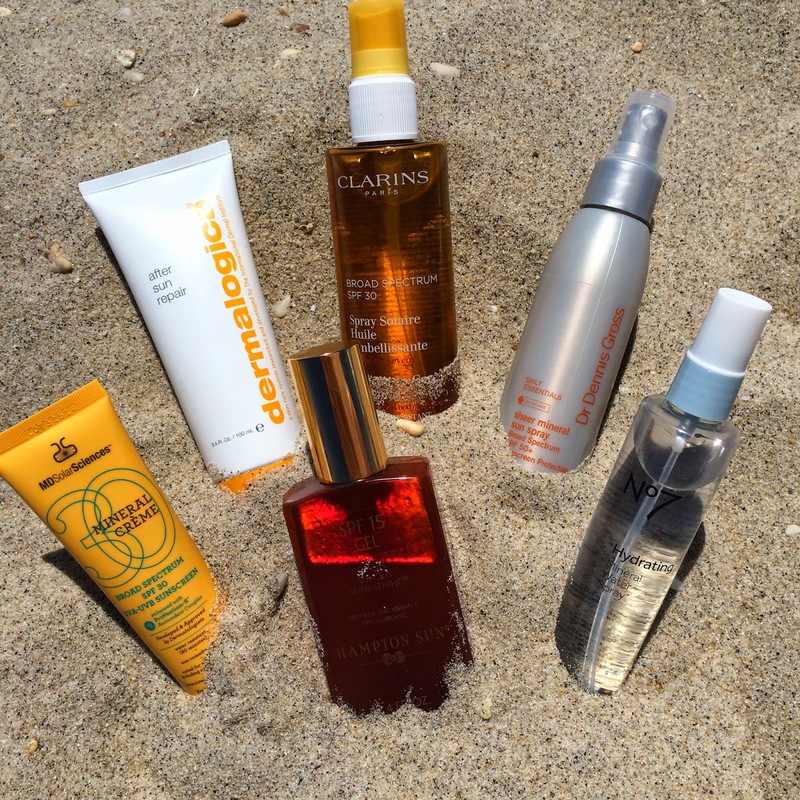 Clarins Broad Spectrum SPF 30 Oil Spray - I always associate tanning oils with my early teen years when I would just bake myself at the beach all day. Yowsa! I normally avoid tanning or sunscreen oils at all costs now because I associate them with fried skin. But Clarins is the skincare expert so I figured I needed to give it a try. I only used it on my arms just in case, and surprisingly I did not burn. Obviously it has SPF 30 so there is sun protection built in, but I was happy with the results as well as the texture. It dissolved immediately into my skin and did not leave any annoying residue that would allow sand to stick to me. 4. Dr. Dennis Gross Sheer Mineral Sun Spray SPF 50 - I have two words for this sunscreen - HOLY GRAIL. I tried this spray on a whim after it was sent to me, and had absolutely no preconceived notions as to how it would perform. One spray in and I was amazed. The texture of the lotion is so smooth and hydrating that it feels as if I am putting lotion on rather than sunscreen. I have used it a bunch of times since the beach and each time I fall more and more in love with it. Consider this a summertime staple in my book. If you are looking for a high level SPF sunscreen for everyday as well as at the beach, this is it! Your skin will thank me and send me a muffin basket. 5. No. 7 Hydrating Mineral Water Spray - A day at the beach is not complete without a hydrating mist. This is a no muss, no fuss spray that helps me stay hydrated and cool. Even when left in my beach bag the whole day, it was still refreshing to use. I even took a bit out when I got home to put in a travel sized spray to keep with me in my purse. Mist on the go is my new motto. 6. Hampton Sun SPF 15 Gel - Not an oil and not a lotion, this texture falls right in the middle. Because of the low SPF, I prefer this for a day running errands or when I am only going to be out for a short period of time. It is not strong enough for my long days at the beach, but for many who want to get a nice even-toned tan, this is perfect for sun bathing. My husband has used this each time we go to the beach and he loves the color he gets afterwards. I do find it helps promote healthy tanning which is why I don't mind it when I plan to be out for an hour or two - even pale gals prefer a teensy tiny bit of color once in a while.